Not shaking and nosing for doors off mirrors-Triangle has stability, add a fixed-pole for both side, avoid shaking and nosing, enjoy the view when driving. Jeep mirrors doors off offer wide field of vision-7.7inch large mirrors offer wide field of vision, quick remove and install. Tighten them, they will stay in place. 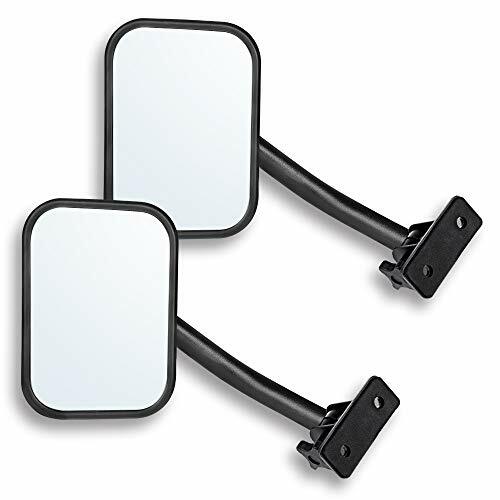 Jeep side mirrors simple and effective to use-Doors off mirrors are simple and effective to use and all mirror mover parts are removed when the doors are back on. 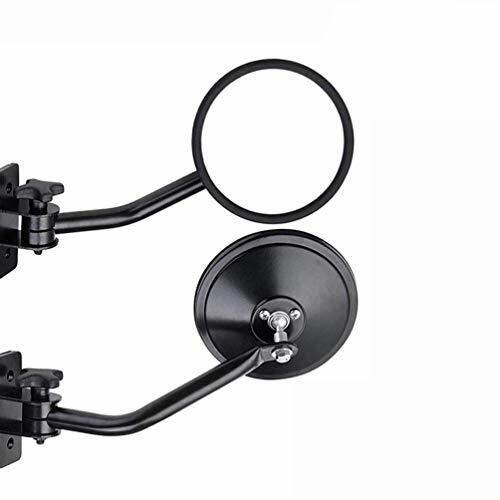 PROTECT MIRROR-Mirror arms feature smooth shanks with nylon washers that will not mar hinge paint. Adventure Mirrors feature steel construction with a durable black powder coat finish. 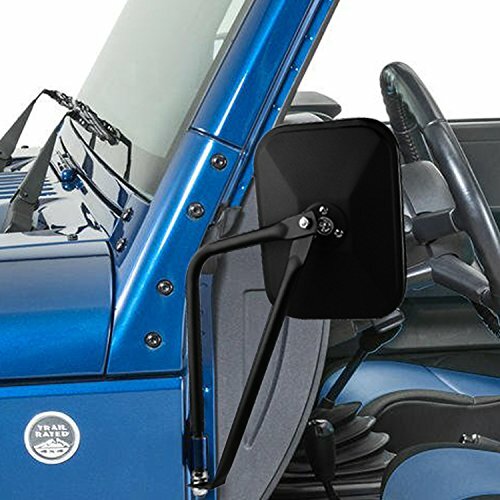 Wide Vision and Shake proof ----- The long adjustable arms and 6.3 inch large square mirror give you great visibility with your doors off or on. Our mirrors gonna to hold well through wind and it is easy for you to tighten down with our included wrench. Tighten the brackets, they will stay in place without vibration or wobble . Tougher Steel Bracket Arms ----- Sturdy & Durable, well match to your Jeep. Our brackets also coated with black powder for rust prevention . The screw which painting chrome avoid the problem of rusting. Base with Soft Foam Rubber Protects Paint from Scratches ----- We won't leave any traces on your car. Fits for ----- 4X4 2007-2017 Jeep Wrangler JK; 2007-2017 Jeep Wrangler JK Unlimited.You can refer to the description for more details. Warranty Type ----- 18 MONTHS Limited Warranty. 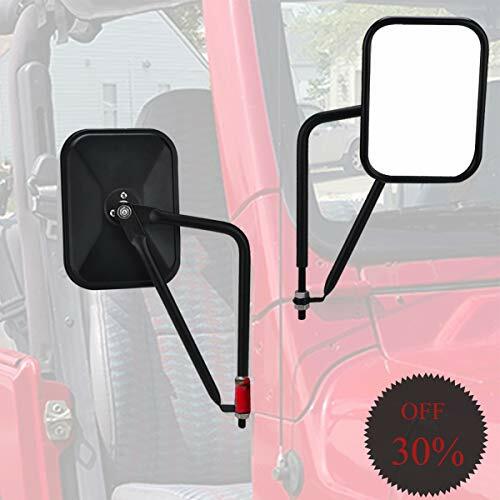 Mirror doors off Kit for Jeep Wrangler gives you the freedom of going door-less without inhibiting visibility. The kit includes a mirror, bracket, and arm as well as screw. 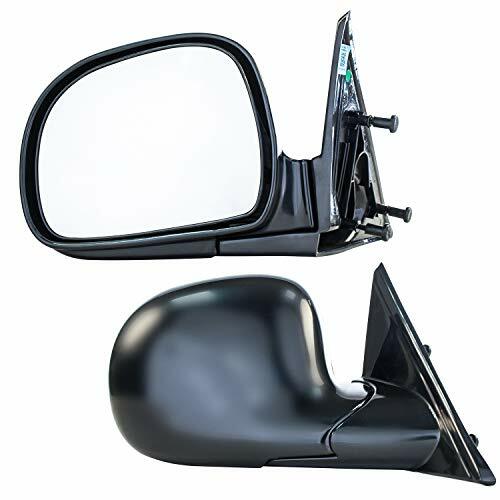 With this kit, you can fix your mirror on the left or right side for custom convenience. 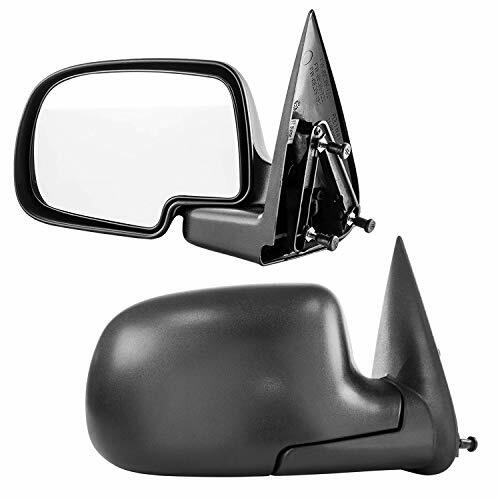 Jeep mirrors includes necessary hardware for trouble-free relocation of your rear-view mirror. The mounting bracket employs a simple locking knob to keep the mount in place, ensuring easy. 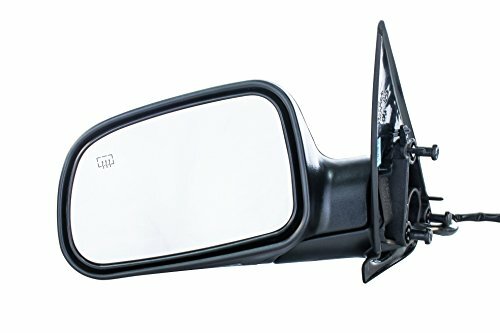 Feature for jeep mirrors: Stick out farther than stock mirrors so there is no hassle with visibility like relocating the stock mirrors. Fits for 4X4 1997-2006 & 2007-2017 Jeep Wrangler, 2004-2006 & 2007-2017 Jeep Wrangler Unlimited, 1998-2006 & 2007-2017 Jeep TJ LJ JK. 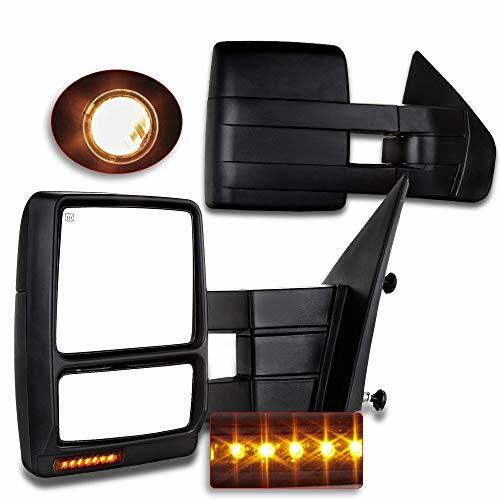 Package come with 2x Side Door Mirrors, 2x Sturdy Arms,2x Mounting Bracket Set. Guarantee:The product with a 24 months warranty. Also offer a 30-day money-back on all orders to allow you to test the our products. Driving with broken mirrors can be dangerous, not to mention illegal. You shouldn't risk your safety because of the high cost of an OE mirror! 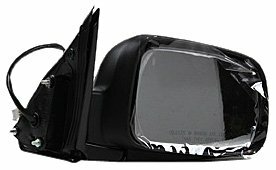 Dependable Direct side view mirrors are direct replacements for factory originals but cost much less. Now you can have OE quality without the OE price. 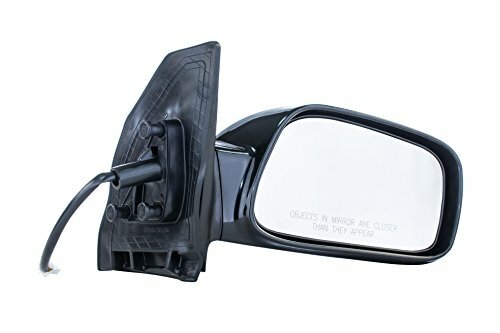 With a Dependable Direct side view mirror, you get a mirror replacement that is identical to OE in every way from the quality to installation. Dependable Direct side view mirrors aren't cheap universal parts that require extensive modifications to your vehicle for fitment. Dependable Direct mirrors look, mount and function the exact same way as the original. Power and heated mirrors have the same electrical connectors, for plug and play installation. Keep your doorless JEEP street legal - When you remove your Jeep doors, you will also be removing the mirrors. 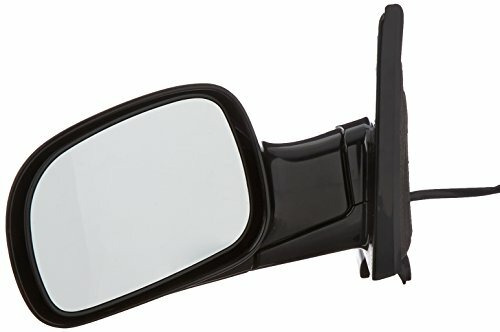 In order to remain in compliance with state laws, you must re-attach your mirrors. All states require that a vehicle have a certain number of mirrors in order for the driver to see around and behind their car. 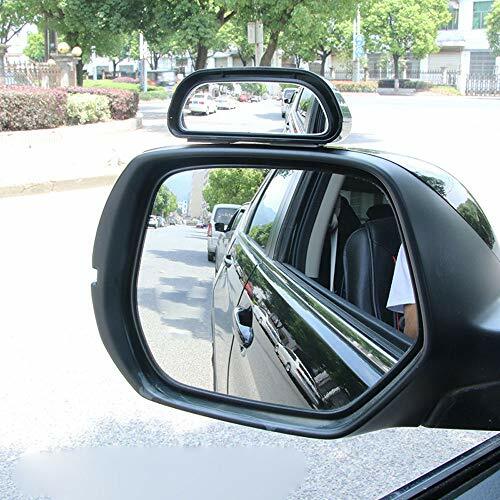 Not shaking and nosing for doorless driving - Triangle has stability, add a fixed-pole for both side, avoid shaking and nosing, enjoy the view when driving. Widely application - The door off mirror fit for 2007-2018 Jeep Wrangler JK JKU ( suitable for jeep hinge with 0.4-0.5 inner diameter ). #45steel pipes and ABS shell - The rectangular mirror adopting high quality #45steel pipes with black diamond plate powder coated finish back, resist corrosion and rust and mirror arms feature smooth shanks with nylon washers that will not mar hinge paint. 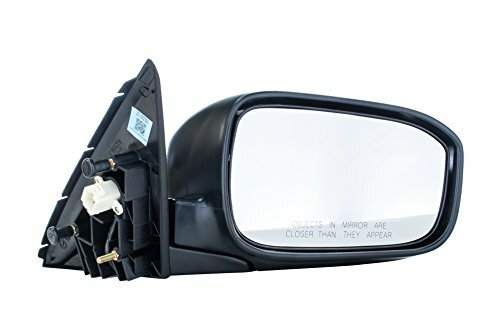 What you get - These rearview mirror are sold as a set of 2 and include everything you'll need for installation including hardware and installation instruction. Our 6-MONTH MONEY BACK guarantee for any reason, 2-YEARS MONEY BACK guarantee quality related. more wind drags. While the streamline mirror back design with precision molding is also a good solution to deal with whistling. 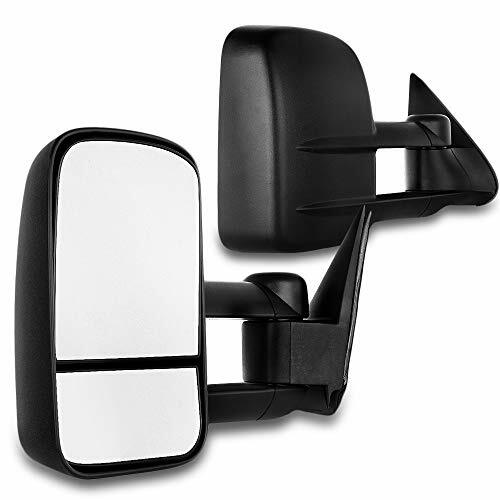 Get A Set of Moveland Bolt-on Door Hinge Mirrors, Enjoy Doorless Safe Drive! 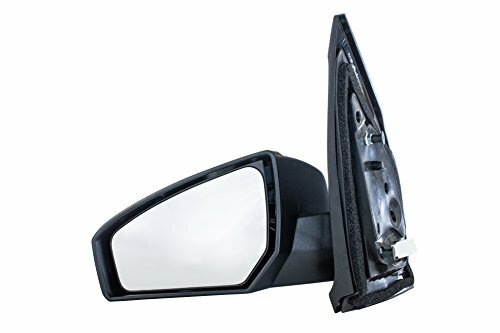 With 360 degree rotary joint bolt on the back of the mirror, it angled pretty well so that you definitely see the full mirror from the driver seat to the passenger side. vehicles behind you, great for changing lane or reversing. It's affordable and makes your jeep street legal as the mirrors can be installed with your doors removed. This is Best Choice for Your Jeep! High Quality Mirror: 45H Tougher steel (super heavy duty )and ABS shell, with 360 degree rotary joint bolt on the back of the mirror can be easily adjust to the perfect viewing angle. Special Design: Streamline design of mirror back and precision molding, effectively reduce wind drags and noisy whistling, better stabilize the mirror and improve the safety of the driver. Clear and Crisp: The image is clear and crisp without distortion, you can easily notice the obstacles/upcoming vehicles behind you, great for changing lane or reversing. Keeps Everything Legal: Easy to install and keeps you to be street legal for happy doorless jeep experience, fits to ALL Jeep Wrangler JK YJ TJ. Drive the doorless jeep and enjoy the fresh air quickly! 1 YEAR WARRANTY and 100% Satisfaction Customer Services. Match the existing mirror assembly or upgrade the appearance to chrome with Dorman's Door Mirror Covers. 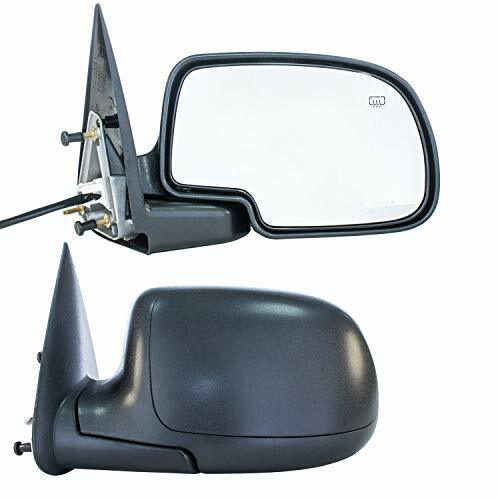 These Mirror Covers reduce repair costs by allowing replacement of just the cracked or damaged Mirror Cover instead of replacing the entire mirror assembly. DUAL GLASS - The mirror face itself is a manual adjustment, so you do need to just use your hand to adjust it where you need it and if you'll notice the littler mirror here at the bottom, that's a built-in spotter mirror. This will help produce blind spots. That is also a manual adjustment. TELESCOPING FEATURE - The telescoping function makes it easy to see around the side of your trailer, so that can safely change lanes, pass or park. 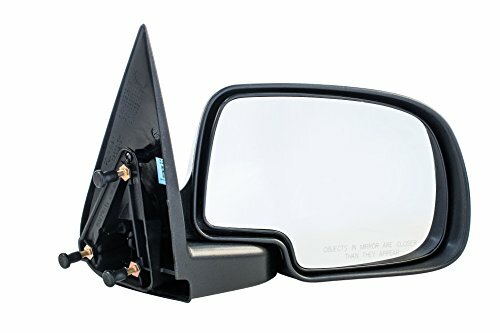 Basically all you have to do is just pull the mirror just like this away from your vehicle and it extends your life of sight by about 4 inches and then when you're done towing. WIDER VISIBILITY - Provides more visibility when towing Provides better and wider angle of rear view. Have you ever had a close call because you were unaware of a vehicle right next to you? Or, almost hit the car in front because you turned around to see that blind spot? At highway speeds one mistake can change your life forever. Unfortunately, factory mirrors just don't provide you with what you need to see or be aware of. You need a way to protect yourself, your family, and those around you. But how? 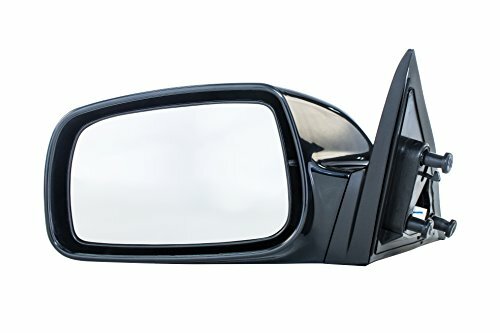 MaxiView, the US patented swiveling blind spot mirror. Unlike other solutions, MaxiView is made in the USA and doesn't compromise when it comes to your safety. First we start off with premium materials. If you were to compare our mirrors with the less expensive options you would immediately see the difference. There are simply no shortcuts when it comes to quality and it all starts with the material. Your road safety is just too important to place your faith in low quality products. Then workmanship. We would love to offer our products at a lower price, the obstacle though is that quality workmanship costs. We searched overseas, but found that in order to maintain the level of quality required production had to be in the US. Skimping on quality, especially on something as important as your ability to see effectively while driving should simply not be an option. When police ask crash victims about their accident most people say "I didn't see the other driver". With MaxiView, the increased scope of vision helps keep your family safe, avoid collisions and high insurance rates. With over ONE MILLION mirrors sold, the thousands upon thousands of buyers can't be wrong. You'll receive the highest standard of customer service and a 30-day money back guarantee, so you have nothing to lose. 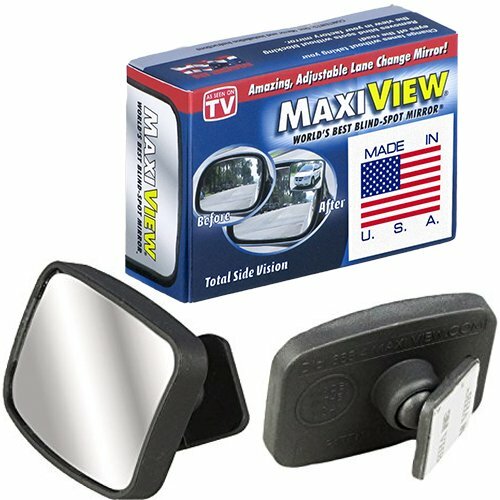 Get your MaxiView mirrors today! GENUINE, US PATENTED PRODUCT. When it comes to your safety (especially at highway speeds! ), don't settle for similar looking knock-offs. Invest in MaxiView and keep yourself, your family and those around you safer. It's the ultimate peace of mind. SEE BLIND SPOTS LIKE NEVER BEFORE. A large, distortion-free image helps you change lanes with confidence and avoid life-changing accidents. Enjoy 3X more viewing than with other convex mirrors. NEVER WORRY ABOUT MIRRORS FALLING OFF. Each mirror comes complete with super strong all-weather bonding strips that keep them firmly in place. It takes seconds to install, but makes life safer forever. MORE SIDE TO SIDE AND LATERAL ADJUSTABILITY. Do you share a car? No problem. Unlike other mirrors, MaxiView has a 360 fully adjustable ball that swivels, giving you 3X more adaptability. With that flexibility you can quickly find the angle that's just perfect for you. GOLD STAR CUSTOMER SERVICE and 30 DAY MONEY BACK GUARANTEE! With over 1 million sold, we specialize in your happiness and safety. Whether it's ordering, installation, or getting the most out of your mirrors, we're here to help. Warranty: MaxiView Mirrors are warranted by the manufacturer against defects in materials and workmanship for a period of twelve 12 months from date of purchase. Quick: the mirror mounts to a bolt-on bracket and is secured with a locking knob that allows for easy installation and removal. The long adjustable arms give you great visibility with your doors off or on. Love taking your doors off, chose jeep mirrors doors off. Have mirror relocation brackets, but dislike the limited visibility they offer with doors on,chose this jk mirror relocation kit. 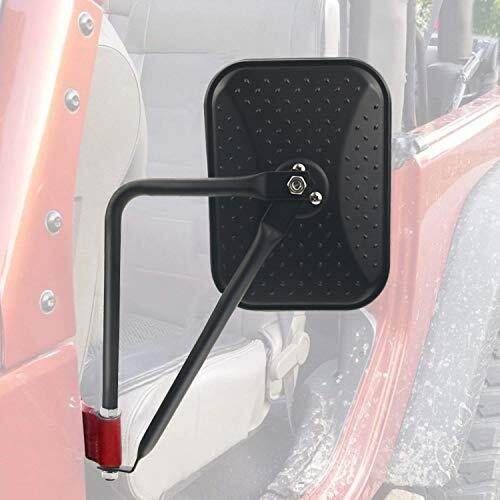 Quick release black rectangular side mirror offers the perfect solution for your Wrangler.Tougher Steel bracket arms, Sturdy & Durable, well match to your Jeep. Package comes in one pair of CJ Mirrors and mount bracket.Locking knob mounting.Installation was quick and easy for jeep cj mirror. Update the screw which painting chrome avoid the problem of rusting. 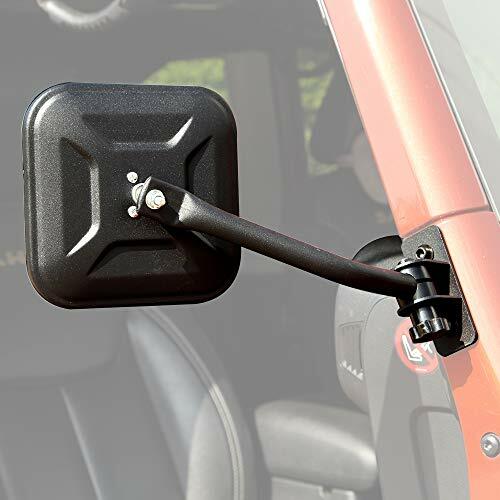 Fits for 4X4 1997-2006 & 2007-2017 Jeep Wrangler, 2004-2006 & 2007-2017 Jeep Wrangler Unlimited, 2007-2017 Jeep LJ JK Jeep Safari, majority warranty which take off the door. Boost your JDM ride's racing presence and give it the F1 racing touch with this pair of carbon fiber pattern side mirrors! 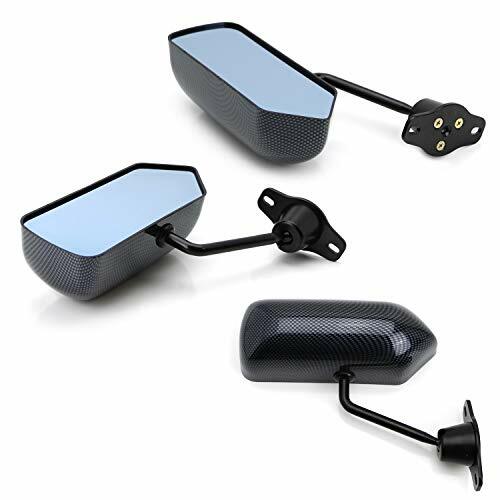 Acura, Honda Mazda Subaru Toyota, Scion Nissan Each package will include a pair of F1 style side mirrors, each measuring at 7.25" x 2.75", mounting hardware, and a set of brackets. As you glance to see what's behind you you'll enjoy the light and sporty blue tint while people in front of you will take notice the sleek and glossy finish of the checkered carbon fiber design (made of ABS plastic). 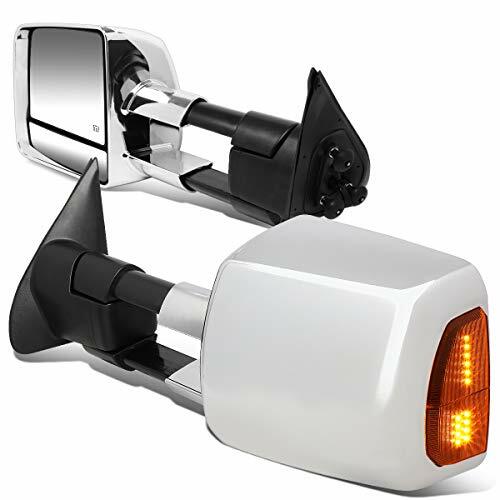 This set of F1 style side mirrors will replace your OEM side mirrors; remove your rearview side mirrors by your driver side and passenger side windows and mount this sleek set of side mirrors in its place. With a pair of carbon fiber pattern F1 style side mirrors, your JDM ride will enhance its performance aura! Fit Acura Honda Mazda Subaru Toyota Nissan Scion etc. 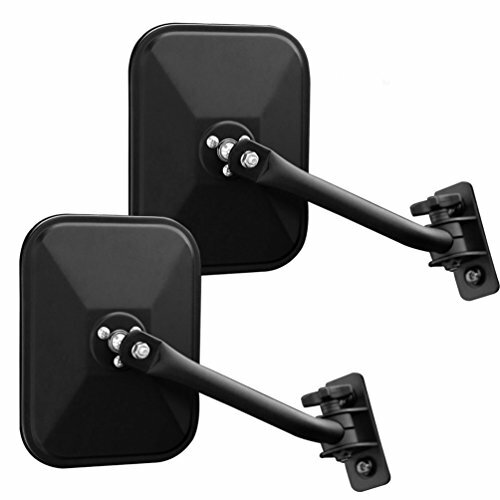 EASY TO INSTALL - This adventure mirror mounts to a bolt-on bracket and is secured with a locking knob that allows for easy installation and removal. There's NO drilling required. 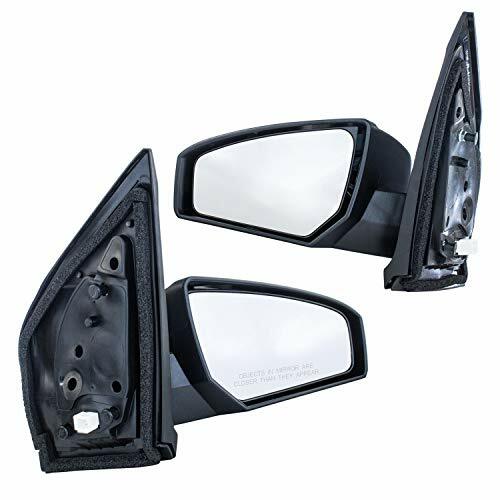 Package comes in one pair of CJ Mirrors, fits for 4X4 1997-2006 & 2007-2017 Jeep Wrangler, 2004-2006 & 2007-2017 Jeep Wrangler Unlimited, 2007-2017 Jeep LJ JK Jeep Safari, majority warranty which take off the door. 2 YEARS WARRANTY - LIBERRWAY provides a 2 years hassle free warranty, enjoy it right now. HEATED - The large mirror has a heat function. It's going to melt away ice, and its also going to prevent it from fogging up. TELESCOPING AND FOLDING FEATURE - The telescoping function makes it easy to see around the side of your trailer, so that can safely change lanes, pass or park. Basically all you have to do is just pull the mirror just like this away from your vehicle. The entire housing of the mirror conveniently folds toward your vehicle for easy parking or maneuvering in tight spaces. These mirrors feature OE-like design connectors to ensure ease of installation. They are Vehicled Test Fitted (VTF) to ensure factory fit, form and function. They come with one year limited product warranty. They also feature highest quality and wide variety of selection and also endure rigorous vibration test. Driving with broken Mirror's can be dangerous, not to mention illegal. You shouldn't risk your safety because of the high cost of an OE Mirrors! 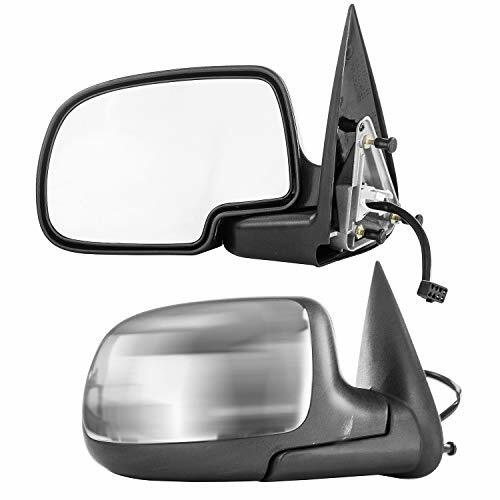 Dependable Direct side view Mirror's are direct replacements for factory originals but cost much less. Now you can have OE quality without the OE price. 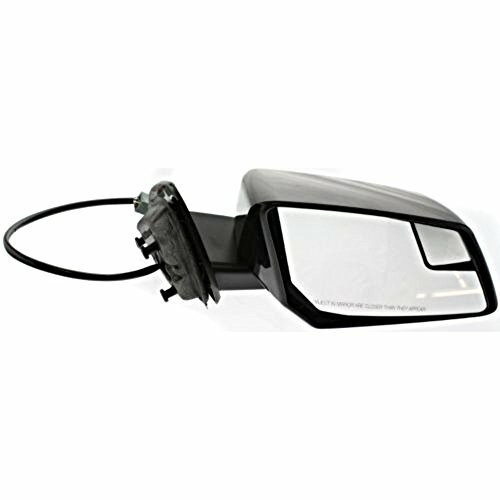 With a Dependable Direct side view Mirrors, you get a Mirrors replacement that is identical to OE in every way from the quality to installation. Dependable Direct side view Mirror's aren't cheap universal parts that require extensive modifications to your vehicle for fitment. Dependable Direct Mirror's look, mount and function the exact same way as the original. Power and heated Mirror's have the same electrical connectors, for plug and play installation. Exactly The Same As Picture! Towing / Camper Style Mirror Assembly! Not Only Cover! 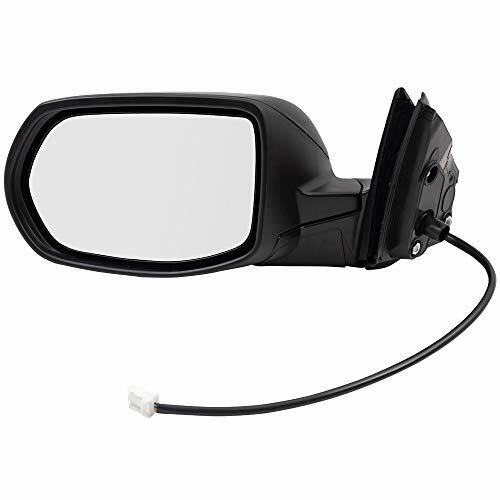 1) It solves dead angle zone of sight perfectly, safe parking multi-purpose auxiliary rearview mirror. 2) Adjustable Blindspot car mirror. 3) You can adjust the angle of reflection freely. 4) Suitable for installation on rearview mirrors and side mirrors. 1) After the position of the adhesive on the rear view mirror of the vehicle is confirmed and cleaned. 2) Tear open the double-sided adhesive coating on the bottom bracket of the product and attach it to the clean mirror Rear-view mirror installation method. 1.Please allow 0.1-0.3cm differences due to manual measurement, thanks.